One of my favorite things to do is entertain, filling the seats around our table with good friends enjoying whatever anyone puts on it. Now that we have a proper table–visible in the header at the top of the page–we’ll definitely be doing more of it! So, when I wanted to try a new method of cooking fish, I threw out last minute invitations under the excuse of celebrating the first week of spring and got cooking. Inspired by a post from thekitchn.com, I decided to make Poisson en Papillote. 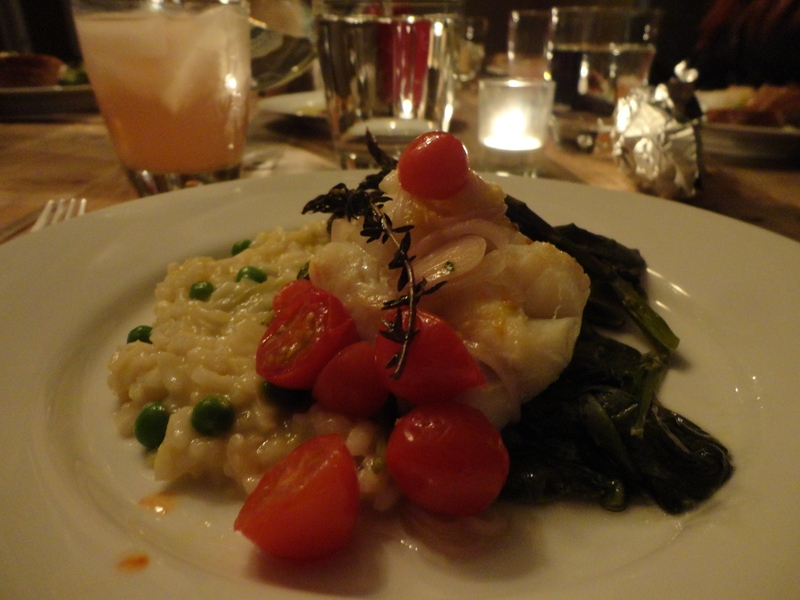 En papillote, like risotto, refers to a method of cooking rather than an actual dish. Basically, it’s something cooked inside an envelope, typically made of parchment paper. I had done it once before with parchment and things didn’t end so well due to my less-than-stellar paper folding ability at the time. This time, I opted for foil. This is a highly flexible recipe which you can adapt to suit your tastes. Below, I’ll give you a few options and highlight in bold what we used. fish – go for something sturdy & thick like halibut, salmon, cod, etc. If using carrot, parsnip or other hard vegetable, maybe try a matchstick size to ensure even cooking. Lay out individual foil sheets large enough to encase your fish & veggies. Too big > too small. You can always start with one sheet and adjust with your second one, just be sure to wash your hands if you’ve already touched raw fish before you reach for that foil box! 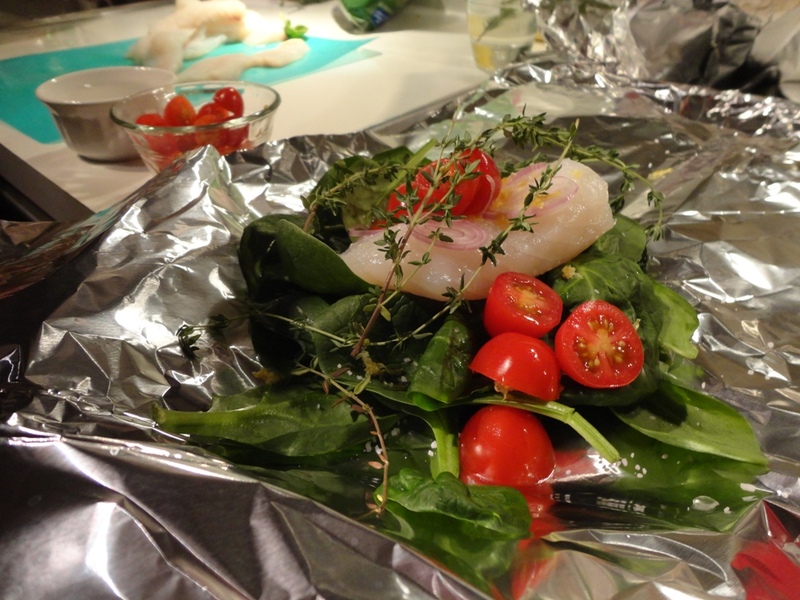 On top of the foil sheet, lay down a bed of whatever greens you plan to use. The more greens you add, the more sauce you’ll end up with. We used a large handful of baby spinach. Top with the fish. Salt and pepper the fish now, then add whatever other ingredients you plan to put in. Carefully bring the long ends of the foil together and tightly seal. Then, tightly seal the two narrow ends. The tighter your seal, the more steam gets trapped and the more evenly your ingredients will cook. Pop those puppies in the oven for about 20 mins and check for doneness. If your fish flakes when pulled with a fork, you’re ready! If you need more time, only cook for 3 minutes more each time as overcooked fish is a sad, sad thing. We ended up serving this over Springtime Risotto with some delicious crusty whole grain bread and paired it with a Rhubarb Cocktail. Overall, it was a perfect celebration welcoming spring with friends. It’s a fancy term, en papillote, but it really conjures up memories of campfire meals shared during Boy Scout trips from my youth. Just goes to show you that often times, simplicity pays off. If you try this method, let me know how it goes. I’m curious to know what combinations you choose.